The Mother's Grief is a support resource to aid you on Her healing passage. Our grief IS the direct pathway to our true innocence, gentlest power and vulnerability. As we allow our grief forth, we become the HEART of the WORLD. Becoming REAL﻿ is a process of letting life love YOU. It means you may not recognize yourself in the end, yet you'll feel more alive than you've ever imagined possible. You may grow soft and vulnerable, your hair may fall out or turn a new shade, lines may appear on your face... who knows how Love will remake you!? Yet you'll become the living testament to an existence of deep surrender to what life and love FEEL like, for you've allowed authentic connection to seep into and alight your heart. A few years ago the deeper intent of my life spun upon its heels, as I saw how easy it was for me to love the world, yet not so easy to allow the world to love me. And so I entered the domains of my heart that kept me closed in, behind glass walls, avoiding the messiness and unpredictability that comes with letting Love completely refashion and reform you. The first stepping stone on this passage was befriending and trusting my grief. Our past wounds keep us from seeing grief as our greatest ally, here to tenderize our hearts, breaking us open to all the ways we've been living through a limited notion of how life and love works. We try sooo hard to control things... and then control some more, as fear steadily grows around our ability to allow our grieving forth. The Mother’s Grief is a passage for your tender heart. It's meant to be a healing and humanizing resource for those who are and will pass through the journey of grief. Its purpose is to offer a heart-opening way of working with, breathing into and living within grief’s deepest wisdom and alchemy. The information contained here has been gleaned from my training, personal journey and years of intimately working with others through their grief process. The ideas and suggestions come from a body of wisdom becoming more commonly known as, Feminine Alchemy. This is the process of deepening in to the wisdom of creation within our own womb and soul center, and inviting forth transformation from within. Sharon offers her intimate prayers and blessings into each package you purchase, connecting in with your unique heart and honoring the longings you've carried for all time. Thank you for your purchase! You will receive an email with additional info, blessings and a link to your audio files. Contact Sharon with any questions. *For shipping outside the continental USA, additional costs will apply. Please contact to coordinate. Get The Mother Ground too! 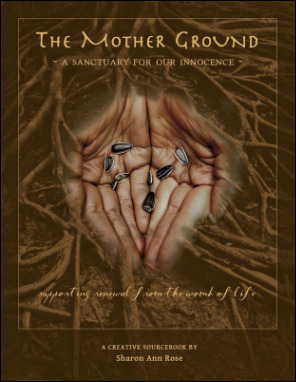 Want to order The Mother Ground Creative Sourcebook too?! Get a 10% discount when you pair them together!